Singapore must press on with the urgent task of transforming its economy so that there will be more opportunities for workers and their families to improve their lives, said Prime Minister Lee Hsien Loong. Preparing workers to take on good jobs will remain at the heart of this transformation journey, Mr Lee said in his May Day message, ahead of his May Day Rally today. "At the heart of our economic transformation is the need to ensure that Singapore continues to offer the right jobs, our workers have the right skills, and there is a good match between the two," he added. Mr Lee said the process will entail many changes, but gave the assurance that one thing will not change: "This Government remains on the side of workers." 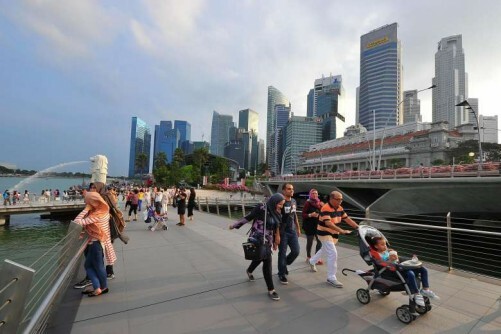 Singapore's economy grew by 2.1 per cent last year, the slowest since the 2009 global financial crisis. In his message, Mr Lee noted that the ageing population and tight labour market will pose challenges, as will slowing growth in China and strong global competition. He said: "Due to these factors, we expect growth to remain at 1 to 3 per cent in 2016." Amid these conditions, the Government is committed to economic transformation and to supporting those "ready and willing to make the effort", Mr Lee said. He cited the recent Budget measures to boost the economy and investments in research and development as examples of resources being pumped in to assist the process. A Committee on the Future Economy is also coming up with strategies to better position Singapore for this more challenging future. While these measures are not targeted narrowly at workers, Mr Lee said they will benefit workers when good jobs are created and the economy is strong. He urged workers to upgrade their skills through SkillsFuture, and be ready to take on the new jobs created. Mid-career and retrenched workers are also getting help to adapt to changing market demands and to renew their skills to meet them. The Government, employers and workers all have a role in transforming the economy, Mr Lee added. Employers must work with unions to redesign jobs and nurture their workers, while workers have to partner employers and stay relevant for the future. "We can succeed if we all work together and each one does his part," he said. "This is not the first time that we have had to reinvent our economy," Mr Lee noted. Economic transformations in the past succeeded because the Government, employers and labour movement worked together to realise a shared vision of improving workers' lives, he added. "I am confident that we will succeed again if we stay united, and work resolutely and patiently at this goal," Mr Lee concluded.